With summer winding to a close, people everywhere are soaking up the last rays and cooling off in the nearest body of water. 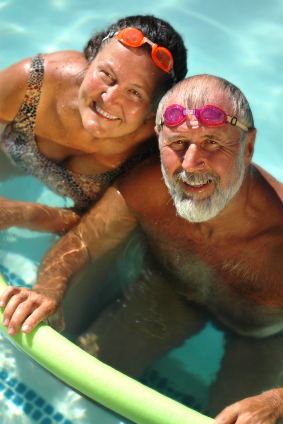 If you are on peritoneal dialysis (PD), you may have heard that you can’t swim because of your catheter. However, this myth, like most, is not always true. People on PD who have a healed catheter exit site may be able to enjoy a little splishing and splashing, as long as they do it with care. Swim only in private, chlorinated pools or the ocean. Private, chlorinated pools and the ocean are the cleanest places to swim in order to avoid an exit site infection. In fact, the ocean water has been said to be beneficial to the exit site. Avoid swimming in fresh water rivers, ponds, streams or hot tubs. Bodies of fresh water and hot tubs harbor bacteria that could cause an infection so these should be avoided. Remove your catheter dressings before swimming. Catheter dressings should always be kept dry and should be removed before swimming, showering or any other water activities. Use something to cover your catheter if your doctor tells you to. Some doctors may recommend covering your catheter with something while you swim, such as an ostomy covering, the bag that people with colostomies wear. Wash your exit site with water and liquid antibacterial soap after swimming. Follow your doctor’s orders for cleaning your exit site after you swim to help keep your catheter and exit site healthy. Talk with your doctor and PD nurse before going for a swim to make sure your exit site is fully healed and it’s okay for you to get in the water. If your healthcare team approves, go for a dip and have some fun in the sun. Buy:Seroquel.SleepWell.Female Pink Viagra.Amoxicillin.Wellbutrin SR.Prozac.Acomplia.Nymphomax.Female Cialis.Lipitor.Ventolin.Buspar.Lipothin.Aricept.Cozaar.Advair.Lasix.Zetia.Benicar.Zocor….